Alongside the major metropolitan areas, a group of smaller cities boast a worthy position in terms of flows. 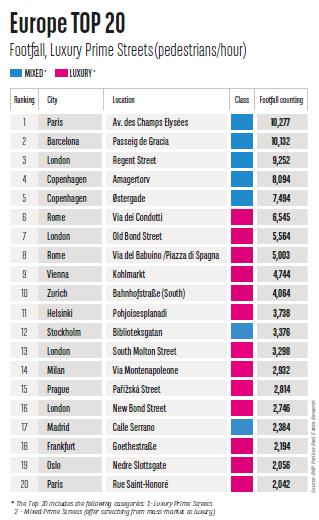 The cities include for example Vienna, Dublin, Zurich and Stockholm which feature in the Top 20 of mass-market prime streets. The local economic and cultural character of these towns has a significant impact on these numbers. However, tourism clearly stands out as a key driver of footfall, all the more so as counting was undertaken in June, when tourism enters the peak periods and sunshine hours are at a maximum in Scandinavia. 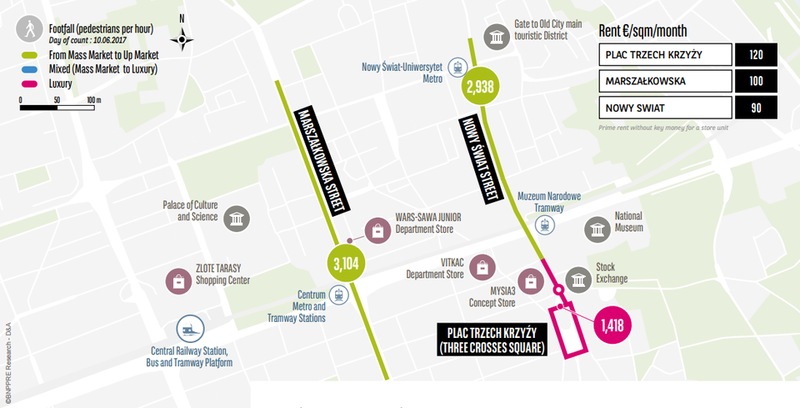 Marszałkowska Street records the highest footfall due to a strategic location at the crossing of two major avenues in Warsaw. Flows are enhanced by Wars Sawa Junior mass-market department store with brands like TK Maxx, H&M, Zara, Home&You, Carrefour, Mango, Empik and C&A. Nowy Świat records second-best footfall volumes. This former Royal route, a favourite touristic thoroughfare, leads to the prime Old Town touristic square and takes advantage of direct proximity to the University. Plac Trzech Krzyży is the most exclusive precinct, close to the Parliament, the Stock Exchange, embassies and consulates. It forms a mix of leisure/catering and luxury retail destination in a prestigious location.